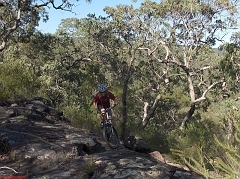 mountain bike riding off the agenda for stephe for a brief while (6 - 12 weeks). After a couple of alternative ideas were floated, Bob and Stephe finally settled on a relatively short local ride out to Coba Point. Eschewing the more usual out and back to the view first, we headed off straight for Smugglers Ridge. Was excellent, as ever. Great flowers out, we were a bit wussy on anything with a slightly technical bent, but that just leaves plenty of improvement for the next visit, eh! 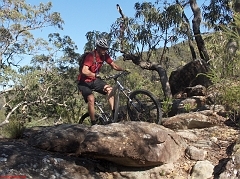 Great ride down the ridge, loooong ride back up the hills. But fun. The track (which is embarrassingly short!) is here. 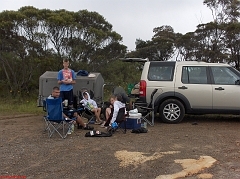 After a bit of a debacle on the camping front (the weather was less than fully kind to us), Brian, Joe, Gus, Hugo and Stephe, Cooper and Ethan thought we should try to at least check out the proposed camping ground at Ingar Creek. 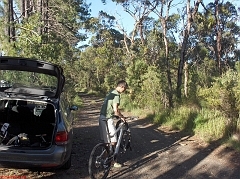 So, we parked the cars at the top of the fire trail, and rode down the 10kms to the bottom (pedaling maybe twice along the way!). 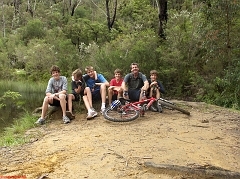 It proved to be a very cool camping ground, and quite possibly worth a future visit. 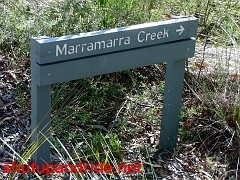 It was not at all clear how to get to the nearby fire trail that connected with Andersons, although the NPWS summary was hopeful "This camping ground is set among scribbly gums. 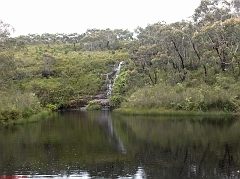 The dam on Ingar Creek is suitable for paddling and swimming, and you can also walk or ride your mountain bike to Bedford Creek, via Murphy's Fire Trail." All in all, was good, but might be more fun in good weather and starting from the bottom! My .kmz of the downhill track is here, and some more photos here.